For those who aren’t already aware, VPSLink offers one of the best prices in the industry for VPS servers. Surely, you would have to consider what it is that you are getting for the price. However, VPSLink remains one of a few leading companies that specialize in only VPS hosting services. The most basic plan at VPSLink begins at the incredible low price of seven dollars a month, which is a steal for a virtual private server that gives you a higher level of flexibility and performance when compared to shared web hosting. VPSLink offers an extremely simple VPS with 2.5GB space, 100GB bandwidth and 64MB of RAM. For those looking for the benefits of a server at a reduced cost, then this is the VPS for you. The starter plan comes with then Xen platform and offers 1 dedicated IP address. All VPS plans have the option of integrating operating systems such as Gentoo, CentOS, Fedora, Ubuntu and Debian. VPSLink includes free setup, LAMP and Ruby on Rails on the side as an additional option. Higher level VPS plans include all of the above mentioned features for no charge at all. From VPSLink, you’ll be able to find virtual private servers that offer up to 40GB disk space, 1000GB bandwidth and 1024MB RAM with 5 IP addresses. If none of the plans work for you; they will be able to create a custom plan based on your specific requirements of memory, space and data transfer. Also keep in mind that VPS servers are all unmanaged leaving you with full maintenance and update responsibility. Since VPSLink offers unmanaged virtual private server hosting; they have a very limited amount of support. When you are first making the purchase for a VPS, you will be notified that there is absolutely no support for any of the services. The company staff will help with basic tasks such as root password resets, account management and DNS management. However, for all other VPS problems such as configurations and hostname filters; you are responsible for fixing it on your own. The VPSLink forum is available for inquiries as well, where other members and moderators may assist you with common issues. You may even find the answer to your problem in the VPSLink support forum. VPSLink is now fully operated from a Boston data center as the servers have been relocated as part of a company buyout. In 2012, VPSLink was purchased by Spry which is based out of Boston. VPSLink servers are monitored 24/7 to ensure that they are running up to par with no technical or security flaws. The hardware used to run the VPS systems are high performance giving you the best performance in speeds and reliability. Since the move to the Boston based datacenter, most customers have noticed an increase in the overall uptime, but there still are no reports on the actual uptime the servers achieve. According to most customer reviews for VPSLink, the reliability seems to be very good as the servers are always online. 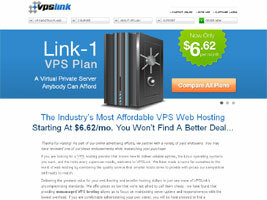 VPSLink offers a great deal on all their VPS plans, provided that you get into a contract with them. The base plan that offers you 2.5GB space, 100GB data transfer and 64MB RAM comes in at $6.62/month for a one year contract. Most web hosting customers prefer a monthly rate, which would come out to $7.95/month. Now, considering that this is a VPS, the pricing still seems to be quite affordable and competitive. The prices for VPS plans range from $7.95/month to $69.95/month and come with either OpenVZ or Xen.